You will be picked up from your hotel in Nairobi and transferred to Nanyuki town where we will spend the day acclimatizing in this old colonial town. Afternoon at leisure with an optional walk to the area around Mt.Kenya Safari club for an acclimatization tour. Dinner and overnight at a Nanyuki Hotel. Depart the hotel after breakfast and drive to Sirimon Park Gate (alt. 2700m). After a picnic lunch, you start an acclimatization hike in the tropical woodland arriving at the Old Moses Camp (alt.3200m) in the early evening. Dinner and overnight at the Old Moses camp. Depart the camp after breakfast and set off for the Shiptons camp(alt. 4200m). On the way enjoy the picturesque views of the MacKinders valley and the Shiptons caves besides the amazing mountain vegetation constituting of the lobelias and the giant groundsels. Arrive at the Shiptons in the late afternoon, dinner and overnight at the Shiptons. At 0300hrs wake up and have some tea and biscuits. Start the attempt of the screech scree to the summit point Lenana (alt.4985m) which is the highlight of our trip! After taking photos with the sunrise, descend slowly to the Mackinders Camp(alt.4300m) where we will have some breakfast, a short rest and then start the hike down to the Met Station(alt.3050m) for dinner and overnight. 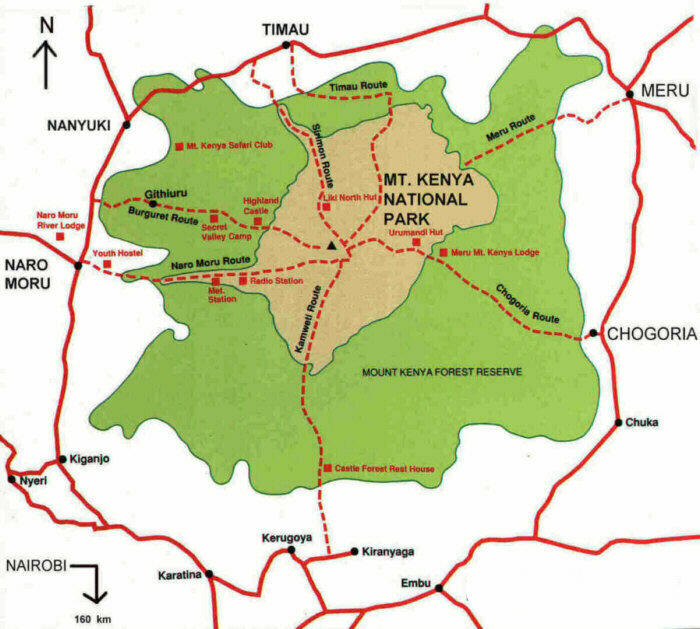 Depart the camp after breakfast and walk leisurely down the forest vegetation enjoying the cool mountain air to connect with the transfer to Nairobi at Naromoru Gate(alt.2700m) for your onward destination.